For the Papal chivalric order, see Order of the Golden Spur. For the related tradition of the stetson, see Cavalry stetson. Certificate for induction into the Order of the Spur for combat action in Tal Afar, Iraq. Military, foreign military, and civilian personnel. Completion of a spur ride or combat service in a cavalry unit. The Order of the Spur is a Cavalry tradition within the United States Army. Soldiers serving with Cavalry units (referred to as "Troopers") are inducted into the Order of the Spur after successfully completing a "Spur Ride" or for having served during combat as a member of or with a Cavalry unit. A trooper who has earned both Silver and Gold spurs is known as a "Master Spur Holder." Traditionally, each Trooper is presented spurs by his sponsor at a ceremonial dining in commonly referred to as the "Spur Dinner". The spurs are to be worn with the military uniform during Squadron or Regimental ceremonies and events or as designated by the Cavalry unit commander. In some units, gold spurs are awarded for combat inductions while silver spurs represent having completed the Spur Ride. Within the tradition, silver spurs and gold spurs hold a similar relationship for the cavalry as the Expert Infantryman Badge hold in the U.S. Army Infantry, as well as the Expert Field Medical Badge and the Combat Medical Badge hold to U.S. Army Medics. There is no Military Occupational Specialty (MOS) requirement for the Order of the Spur and the order is open to members of foreign militaries serving with U.S. Cavalry units. The tradition of having to "earn your spurs" reaches back to the beginning of the American Cavalry. When green Troopers first arrived at their new cavalry assignments they were assigned a horse with a shaved tail. This led to the nickname "Shave Tail" for newly assigned, spur-less Soldiers. These new Troopers were in need of extensive training in all areas of horsemanship. The horse with a shaved tail was given extra space in which to operate since its rider was marked as a novice. New Troopers were given the “Prince of Wales Spurs” because they may misuse or overuse the actual rawel of real spurs, injuring the horse. Only when they were able to prove their ability to perform with their horse and saber were they awarded spurs. 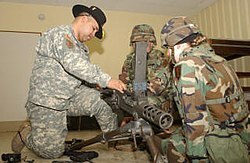 A spur holder with the U.S. 4th Cavalry Regiment instructs candidates on the assembly of an M2 Browning machine gun after their first try during a 2006 spur ride. The Spur Ride is the only means of joining the Order of the Spur, aside from a wartime induction. The conduct of a Spur Ride varies but it is generally an event held over multiple days during which a Trooper must pass a series of physical and mental tests relevant to the Cavalry. Some of the tests evaluate leadership, technical and tactical proficiency, physical fitness, the ability to operate as part of a team under high levels of stress and fatigue under both day and night conditions, though the specific tests vary by unit. A written test is often also administered, with questions that cover United States Cavalry and unit history. During the Spur Ride, candidates are also often required to recite from memory the traditional cavalry poem, "Fiddler's Green", or other traditions or historical information pertaining to the Cavalry. Score a minimum of 270 on the Army Physical Fitness Test (APFT). Meet height and weight requirements of AR 600-9. Qualify "Expert" with primary weapon (generally a M9 or M16/M4). Upon successful completion of the Spur Ride, new spur holders are welcomed with a formal induction ceremony. The ceremony is a dining in, called the Spur Dinner, that often includes other military traditions such as honoring lost comrades, a ceremonial punch  (called a grog), and a roll call of the successful candidates. Some units also hold a "hero's breakfast" immediately following the end of the Spur Ride. During the breakfast, the unit commander presents a toast welcoming the successful candidates to the brotherhood prior to the formal induction ceremony. 3d Armored Cavalry Regiment's Commander in Iraq wearing the Stetson. Spurs worn on the U.S. Army's Desert Combat Boots. 1. Stetson: The Stetson will be black in color. Rank and regimental or ordinary cavalry brass will adorn the Stetson. The braid will be worn around the base of the Stetson. Troopers will wear the appropriate braid color. Braid ends or acorns will be to the front of the Stetson and no more than an acorn length over the brim. Crossed sabers will be placed on the front of the Stetson. Organizational sabers are authorized if assigned or affiliated to the regiment. Rank will be worn 1/8" from the bottom of the sabers, centered. (1) The nape strap will be threaded through the appropriate eyelets in the brim of the Stetson so that strap goes around the back and the buckle is fastened and centered on the wearers head. (2) The sides of the crown shall not be pushed in or otherwise modified. The brim will be flat with a slight droop at the front. (3) The Stetson will be worn on the head with the brim parallel to the ground. (4) Occasions for wearing the stetson: Squadron dining-ins/outs, formal events in dress blues, gatherings of spur holders, professional gatherings such as AAAA and any other event or function as designated by Saber 6. 2. Spurs: Spurs will be worn as a matched pair. The type of spurs allowed are set by each unit but most often they are Prince of Wales style spurs. a. Low Quarters: The spurs will be affixed to the footgear midway between the upper portion of the sole and the lower part of the heel along the seam of the shoe. The U shaped portion shall enclose the shoe in such a manner as to assure that the rowel of the spurs curves down to the ground. The strap will be fastened over the instep of the footgear in such a manner that the buckle faces to the outside of the foot. b. Boots: The spurs will be affixed to the footgear so that the U shaped portion follows the seam of the ankle support. The strap will be fastened over the instep of the footgear in such a manner that the buckles face the outside of the boot. c. Single Soldiers will wear the rowels of their spurs pointing up, while married Soldiers will do so with their rowels pointing down. 3. Occasions for Wear: Spurs and stetsons will be worn at all cavalry functions, otherwise, they will not be worn outside of the cavalry footprint. Stetsons and spurs may be authorized by the local command, but are not authorized for wear at Army functions not specifically dedicated to cavalry. Wear with civilian attire may be restricted by a local commander, but otherwise the spurs and Stetson may be mixed with civilian attire when rank has been removed. 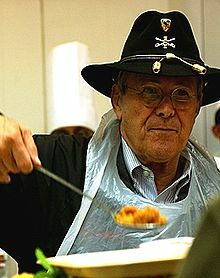 Former Secretary of Defense Donald Rumsfeld serves Christmas Eve chow to Soldiers deployed to Baghdad, Iraq. In place of rank, the secretary had a 1st Cavalry Division DUI pin. 4-25. Tradition is a customary pattern of thought, action, or behavior held by an identifiable group of people. It is information, beliefs, and customs handed down by word of mouth or by example from one generation to another without written instruction. Our military traditions are really the "Army Way" of doing and thinking. An interesting thing about traditions is that many of our Army traditions started out as something quite different from what they are now. 4-26. Military tradition is an interesting and often amusing subject. It gives a Soldier a feeling of pride to understand just why we do things the way we do. Traditions are expressed in the things we do, the uniform we wear, and the things we say. Many of the words we use in the Army are unique and have been added to our vocabulary from different parts of the world and at different times in history. Ceremonial duties. Soldiers of the Old Guard, the 3d U.S. Infantry, have been Sentinels of the Tomb of the Unknown Soldier since 1948. The green berets of the Army's Special Forces. Special designations (authorized unit nicknames) such as Cottonbalers, the 7th Infantry Regiment. Distinctive items of clothing worn in your unit such as headgear, belt buckles, and tankers' boots. Unit mottoes such as "Victory!" or "Send me!" "Hooah!" This informal but always understood sound is less a word than an audible affirmation of the warrior ethos. The Soldier that utters that sound understands his task and will not quit until it is completed. That sound means Soldiers are ready and willing to accomplish the mission at hand. Like the Order of the Spur, the Cavalry Stetson is an Army Tradition and regulated by a soldier's unit commander. However, unlike the Order of the Spur, the Cavalry Stetson is usually worn by a Trooper immediately upon their assignment to a Cavalry unit. While the Cavalry Stetson holds a similar status to the Order of the Spur, for members of the cavalry the awarding and wear of the Cavalry Stetson is distinct from the awarding and wear of spurs. The cord around the Stetson, used to be used to assist with securing the Scouts’ horse to a object while the Soldier dismounted. Knots in the cord by the Acorns of the cord represented combat. Every half knot represented 1 single Combat Campaign. After two knots were given on a single Stenson, he became the ‘SME’ (Subject Matter Expert) on the battlefield. Drew Carey wearing the 3d ACR Cavalry Stetson during a USO visit to Al Asad Airbase, Iraq. WASHINGTON, APRIL 1, 2011 -- In a fingertip-to-the-brim nod to its American frontier history, the Army is changing hats again - returning to the tumultuous days of the horse Cavalry in the wild west and adopting a dark blue Stetson as the official headgear for the current force of 1.1 million Soldiers. "We figure the Stetson will be popular with the troops," said Sgt. Maj. Bob S. Stone, Army Uniform Board headgear task force president. "It's been a while since we have changed the headgear, so it's time. Plus a Stetson is functional and down right American." But reminiscent of the controversial switch from the garrison cap to the black beret, the Army faces opposition from one community deeply opposed to losing its special identity with the Stetson - the Armor branch. "Why in the heck are they doing to us what they did to the snake-eaters'" asked one officer familiar with the board's deliberations. "If you ain't Cav, you ain't ought to be wearing a Cav hat. That just ain't right." ... The Army's official adoption date of the Stetson will be April Fool's Day, 2012. The statement was supplemented by pictures of soldiers with stetsons photoshopped over their berets, including an Army dog toting a stetson. ^ "1st Cavalry Division Order of the Spur". HomePage Of America's "First Team". January 2013. ^ cjenkins (user name). "Wear of the Cavalry Accouterments" 1 June 1997. [personal website] www.mindspring.com. Accessed 24 February 2008. ^ "Stetson hat to be new Army standard headgear". army.mil. http://www.cavhooah.com/spurs.htm A site about spurs in the Cavalry. http://www.hood.army.mil/3d_cr/about/pdfs/PolicyLetters/Stetson_Policy.pdf 3d CR's Order of the Spur regulations. http://www.1cda.org/MOI-CAV%20HAT%2015%20Aug%202010.pdf 1st CD's Order of the Spur regulations. This page was last edited on 18 February 2019, at 20:03 (UTC).